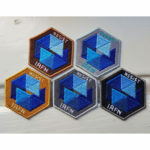 The IRFN shop is live! You can now purchase our set of five patches based on the logo designed by artist Mercedes Vandendorpe and help support IRFN. For each OP hosted on IRFN, we will donate 1 patch to a lucky winner. The patch will be mailed free of charge. Depending on the number of patches that we sell here, we will donate a given amount to OPs that have reached at least 50% funding.